Me, David Oaks, middle in front in my powerchair with my big brother Tony Oaks, friend Rev. Phil Schulman (center, standing), and my wife Debra Nunez. One of my very best friends for many years is the creative, loving, wise, funny Phil Schulman. Phil is a minister who has led several Unitarian Universalist congregations. Phil has been such a prominent, positive leader in so many movement gatherings of mental health consumers and psychiatric survivors that I affectionately call him “The Mad Movement Minister”! In November 2017, while biking from home to an Alcoholics Anonymous meeting (Phil has been clean and sober for many decades) a truck hit him. Phil suffered a major traumatic brain injury (TBI). He spent a long time in a coma. Since then he has devoted much of his time to recovery in a way that models values of our movement. He has shown faith, humanity, empowerment, community, humor, love, peer support, spirituality, wisdom and so much more. Last week I had the pleasure and honor of nominating Phil as a speaker in one of the main gatherings of our movement. I have been close friends with Phil for several decades. I myself have been an activist in the mental health consumer / survivor movement for more than four decades, including co-founder of MindFreedom. Since 2012, because of disabilities, I am semi-retired. In all my career, I would consider Phil to be one of the greatest treasures in our movement. I give him my very highest recommendation for your keynoter. Phil became a minister and has served as a church leader in several congregations in several states. He is also an advocate in the peer “lived experience” consumer / survivor movement. Phil has actively participated in many Alternatives conferences, NARPA conferences, etc. In fact, I and a few others refer to Phil affectionately as “the mad movement minister.” As I noted, Phil has a lived experience with several mental distresses in his past. He has been clean and sober for many decades, regularly attending AA. Phil, shortly after his 2017 accident, when a truck hit him on a bicycle. It was riding from home on his bike to an Alcoholics Anonyomous meeting in Florida back in November 2017, that Phil, as I say, “re-established his movement credentials.” A truck struck Phil as he rode his bike that night, throwing him into a coma with extreme and severe head injuries. Phil also had a large number of challenging physical impairments. Phil has dedicated the last year-and-a-half to showing us all the value of our movement beliefs. Phil has activated a network of supportive community leaders. He has engaged in many hours of extensive rehab regularly. He has applied his extensive wisdom of spiritual growth. 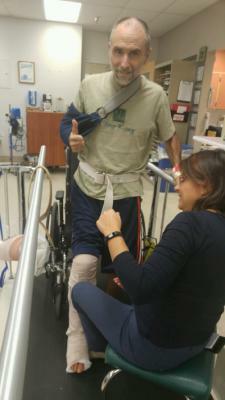 Phil has spent countless hours doing rehab, including physical therapy, for his recovery. uncertainty if I would walk or talk again. Ten months later, here I am. A member at the clubhouse I attend, told me that he loves my NJ accent. brain injury accent.” Ok sometimes my Jersey accent comes out a little. mean so much to have companionship. True? caring and following my progress. Support has helped me to achieve spectacular results in recovery. and tools from past trauma have helped me too! communities that offered gifts for recovery. to release the lingering effects of trauma. became critically important to me. more pain medication. Patients would share with me their inner pain. for how my beliefs put me in conflict with our mental health system. structures that keep control of resources in the hands of the richest 1%. to address their conflicts. 5- believe in people’s capacity to recover. through that more recent journey. expedition for his book. We planned to leave early Tuesday morning. On Monday I texted him that I would arrive at his home by about 9pm. gone out on my bicycle and incorrectly assumed I would be back soon. badly broken body. I felt achy all over. knew I didn’t reach my destination. I put two and two together. from me? I realized that I couldn’t speak. relieved when he left for the quiet that returned. windowless hallways to an operating room. I was lost in space. curious and amused by these altered states. was real. It reminded me of a scene from Alice in Wonderland. remember the tune. For the next month I sung all day long. didn’t have much success. Writing on paper didn’t work much better. knew that if I didn’t make a change, things would not go well for me. there was none to be had. I felt hopelessness overtaking me. her Facebook posts; pictures of good times with her boyfriend Mark. That she still cared and acted boldly was powerful. Phil flips trauma and tragedy into recovery and growth. We love you, Phil! calls, meals, rides, generous gifts to support my medical costs. responded and treated me with warmth. Resources fell in my lap. My first Alternatives conference was 2012. I attended a workshop thatPhil led. It was incredibly profound. For the first time in too long,I felt someone had gone in to thedeep recesses in my soul, and planted flowers where only hurt seemed to exist. At the second Alternatives (2013), Phil said in his workshop that he was a minister. Oh my god. I had walked away from churches in the past, and on,y recently started attending a UU church. So when he said he was UU… oh my God. He embodies the principles of our association.